Two Senate Democrats facing tough re-elections next year in Republican states have said they would vote for President Donald Trump's Supreme Court nominee. 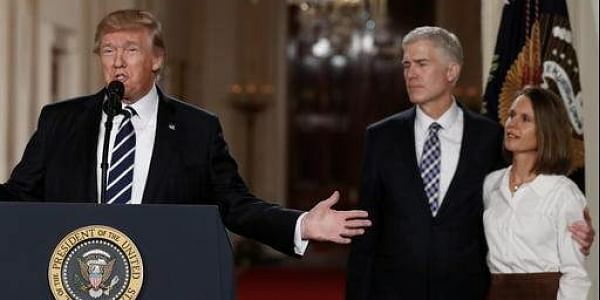 WASHINGTON: Two Senate Democrats facing tough re-elections next year in Republican states have said they would vote for President Donald Trump's Supreme Court nominee as another colleague warned of the political risks in voting to block Judge Neil Gorsuch. West Virginia Sen Joe Manchin and North Dakota Sen Heidi Heitkamp announced in separate statements yesterday that they would join the 52 Senate Republicans in supporting the Denver-based appellate judge. A Senate vote on confirmation is expected later next week. "I hold no illusions that I will agree with every decision Judge Gorsuch may issue in the future, but I have not found any reasons why this jurist should not be a Supreme Court Justice," said Manchin. Heitkamp said she expects Gorsuch to follow through on his promise of an independent judiciary that "acts as a proper check and balance on the other two branches of government." Senate Minority Leader Chuck Schumer, D-NY, said last week that Democrats would filibuster the nomination. With a 52-seat majority, Republicans need eight Democrats to vote with them to break the 60-vote threshold to move forward. It's unclear if they will have those votes -- of the 10 Senate Democrats who are up for re-election in states Trump won, five have already said they will vote against him. McConnell has made it clear he will change the rules if he doesn't get the votes, meaning they could proceed to a final confirmation vote with only a simple majority. In all, 33 Democrats have said they will oppose Gorsuch. Washington Sen Maria Cantwell announced her opposition yesterday, saying she has concerns about his record. Missouri Sen Claire McCaskill, who says she is torn over how to vote, highlighted the dilemma for Democratic senators running next year in states that Trump won. Should they vote for Judge Neil Gorsuch and anger their liberal base? Or vote to block Gorsuch and prompt Republicans to permanently change Senate rules to eliminate the filibuster? The rule change would allow Gorsuch to be confirmed quickly and also make it easier for the majority party to confirm justices in the future. "It is obviously a really difficult situation, that both alternatives, I think, have a lot of danger," McCaskill told reporters yesterday.